Paphos International Airport (Greek: Διεθνής Αερολιμένας Πάφου; Turkish: Baf Uluslararası Havaalanı) (IATA: PFO, ICAO: LCPH) is a joint civil-military public airport located 6.5 km (4.0 mi) southeast of the city of Paphos, Cyprus. It is the country's second largest airport, after Larnaca International Airport (although it is important to note that Cyprus only has three functioning civilian airports). Paphos Airport is commonly used by tourists on vacation in western Cyprus, providing access to popular resorts such as Coral Bay, Limassol (about 50 km (31 mi) south-east) and Paphos itself. In May 2006, Hermes Airports Limited took over the construction, development and operation of both Larnaca and Paphos airports for a period of 25 years. According to the airport operator, Paphos Airport served 1,744,011 passengers in 2007. A new terminal opened at Paphos in November 2008. On 10 January 2012, Ryanair announced they were to open their 50th base in Paphos. In April 2012, they placed 2 aircraft in Paphos with 15 new routes, offering over 80 flights a week. Ryanair claim the reason they opened the base in Paphos was due to reduced landing charges offered by Hermes' incentive scheme, as well as the fact that they can easily operate within their standards (e.g. their typical 25 minutes turnaround time). A new four-lane road is being planned to link the airport and Paphos so passengers and staff can avoid using the B6 Main road and the E603 secondary road which are often heavily congested. Paphos International Airport Check-In hall. Passenger facilities include 28 check-in desks, 1 special baggage check-in, 7 gates, 22 aircraft stands, a bank, restaurants, cafeterias, bars, a duty-free shop and a gift shop. Other facilities include a tourist help desk, car rental, first aid, a baby/parent room and disabled access facilities. Refrigerated storage, health officials, and X-ray equipment are among some of the facilities provided for cargo. Furthermore, loading platforms and forklifts are also available. There is a regular bus service from Paphos Harbour station to the airport, limited services also run to/from Paphos Town (Karavella) and Polis . Direct buses to/from Limassol,  Nicosia and Larnaca are also available. On 21 September 2011, a Thomson Airways Boeing 737-800 inadvertently landed on the taxiway parallel to the runway (Taxiway Bravo, formerly Runway 11L/29R). No other aircraft was on the taxiway at the time, and the Thomson taxied safely to the apron. By 2014, yellow "TAXI" markings were painted across the width of the parallel taxiway near either longitudinal end, facing approaching aircraft; and a "TAXIWAY" marking was painted at its junction with Taxiway Charlie (about midway), facing the latter. ^ "Passenger Traffic". hermesairports.com. Retrieved 6 February 2019. ^ a b "EAD Basic - Error Page". www.ead.eurocontrol.int. ^ Hermes Airports, Passenger traffic 2007, 9 August 2008. 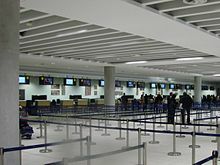 ^ "Revamped Cyprus airport opens for business". The Daily Star. Agence France Presse. 18 November 2008. Retrieved 18 November 2008. ^ Li, Jim (5 February 2019). "Arkia adds Paphos service from June 2019". Routesonline. Retrieved 5 February 2019. ^ "Cyprus". aarhuscharter.dk. 17 October 2018. ^ a b c d "Charter flights at low prices". tui.pl. ^ a b Liu, Jim (5 February 2019). "Israir schedules new Paphos charters in S19". Routesonline. Retrieved 5 February 2019. ^ a b "Flight Timetable". tui.co.uk. ^ "Cyprus - Pafos". tishourytours.com. 15 March 2018. ^ "Ryanair launches 15 new winter routes". maltatoday.com.mt. 14 March 2019. ^ "Ryanair to Launch 21 New Routes from Greece for Summer 2019 - GTP Headlines". news.gtp.gr. ^ "Paphos, Cyprus - Destination info". aurinko.ee. ^ a b c "air and charter tickets". itaka.pl. ^ "TIMETABLES – Limassol Airport Express - EAL LTD". enlimassolairportexpress.eu. ^ "Kapnos Airport Shuttle". www.kapnosairportshuttle.com. ^ Hradecky, Simon (22 September 2011). "Incident: Thomson B738 at Paphos on Sep 21st 2011, landed on taxiway". The Aviation Herald. Retrieved 26 October 2014. This page was last edited on 23 April 2019, at 15:01 (UTC).